THE SUBJECT on which I have to speak this evening is the tides, and at the outset I feel in a curiously difficult position. If I were asked to tell what I mean by the Tides I should feel it exceedingly difficult to answer the question. The tides have something to do with motion of the sea. Rise and fall of the sea is sometimes called a tide; but I see, in the Admiralty Chart of the Firth of Clyde, the whole space between Ailsa Craig and the Ayrshire coast marked "very little tide here." Now, we find there a good ten feet rise and fall, and yet we are authoritatively told there is very little tide. The truth is, the word "tide" as used by sailors at sea means horizontal motion of the water; but when used by landsmen or sailors in port, it means vertical motion of the water. I hope my friend Sir Frederick Evans will allow me to say that we must take the designation in the chart, to which I have referred, as limited to the instruction of sailors navigating that part of the sea, and to say that there is a very considerable landsman's tide there—a rise and fall of the surface of the water relatively to the land—though there is exceedingly little current. One of the most interesting points of tidal theory is the determination of the currents by which the rise and fall is produced, and so far the sailor's idea of what is most noteworthy as to tidal motion is correct: because before there can be a rise and fall of the water anywhere it must come from some other place, and the water cannot pass from place to place without moving horizontally, or nearly horizontally, through a great distance. Thus the primary phenomenon of the tides is after all the tidal current; and it is the tidal currents that are referred to on charts where we have arrow-heads marked with the statement that we have "very little tide here," or that we have "strong tides" there. One instance of great interest is near Portland. We hear of the "race of Portland" which is produced by an exceedingly strong tidal current; but in Portland harbour there is exceedingly little rise and fall, and that little is much confused, as if the water did not know which way it was going to move. Sometimes the water rises, sinks, seems to think a little while about it, and then rises again. The rise of the tide at Portland is interesting to the inhabitants of Southampton in this, that whereas here, at Southampton, there is a double high water, there, at Portland, there is a double low water. The double high water seems to extend across the channel. At Havre, and on the bar off the entrance to Harve, there is a double high water very useful to navigation; but Southampton I believe is pre-eminent above all the ports in the British Island swith respect to this convenience. There is here (at Southampton) a good three hours of high water;—a little dip after the first high water, and then the water rises again a very little more for an hour and a half or two hours, before it begins to fall to low water. I Shall endeavour to refer to this subject again. It is not merely the Isle of Wight that gives rise to the phenomenon. The influence extends to the east as far as Christchurch, and is reversed at Portland, and we have the double or the prolonged high water also over at Havre; therefore, it is clearly not, as it has been supposed to be, due to the Isle of Wight. But now I must come back to the question, What are the "Tides"? Is a "tidal wave" a tide? What is called in the newspapers a "tidal wave" rises sometimes in a few minutes, does great destruction, and goes down again, somewhat less rapidly. There are frequent instances in all parts of the world of the occurrence of that phenomenon. Such motions of the water, however, are not tides; they are usually caused by earthquakes. But we are apt to call any not very short-time and fall of the water a tide, as when standing on the coast of a slanting shore where there are long ocean waves, we see the gradual sinkings and risings produced by them, and say that it is a wave we see, not a tide, till one comes which is exceptionally slow, and then we say "that is liker a tide than a wave." The fact is, there is something perfectly continuous in the species of motion called wave, from the smallest ripple in a musical glass, whose period may be a thousandth of a second, to a "lop of water" in the Solent, whose period is one or two seconds, and thence on to the great ocean wave with a period of from fifteen to twenty seconds, where end the phenomenon which we commonly call waves (FIG. 122) and not tides. But any rise and fall which is manifestly of longer period, or slower in its rise from lowest to highest, than a wind wave, we are apt to call a tide; and some of the phenomena that are analysed for, and worked out in this very tidal analysis that I am going to explain, are in point of fact more properly wind waves than true tides. Leaving these complicated questions, however, I will make a short cut, and assuming the cause without proving it, define the thing by the cause. I shall therefore define tides thus: Tides are motions of water on the earth, due to the attractions of the sun and of the moon. I cannot say tides are motions due to the actions of the sun and of the moon; for so I would include, under the designation of tide, every ripple that stirs a puddle or millpond, and waves in the Solent or in the English Channel and the long Atlantic wind waves, and the great swell of the ocean from one hemisphere to the other and back again (under the name which I find in the harmonic reduction of tidal observations), proved to take place once a year, and which I can only explain as the result of the sun's heat. But while the action of the sun's heat by means of the wind produced ripples and waves of every size, it also produces a heaping-up of the water (FIG. 123). Suppose we have wind blowing across one side of a sheet of water, the wind ruffles the surface, the waves break if the wind is strong, and the result is a strong tangential force exerted by the wind on the surface water. If a ship is sailing over the water there is strong tangential force; thus the water is found going fast to leeward for a long distance astern of a great ship sailing with a side wind: and, just as the sails of a ship standing high above the sea give a large area for the wind to act upon, every wave standing up gives a surface, and we have horizontal tangential force over the whole surface of a troubled sea. The result is that water is dragged along the surface from one side of the ocean to the other—from one side of the Atlantic to the other and is heaped up on the side towards which the wind is blowing. To understand the dynamics of this phenomenon, think of a long straight canal with the wind blowing lengthwise along it. In virtue of the tangential force exerted on the surface of the water by the wind, and which increases with the speed of the wind, the water will become heaped up at one end of the canal, as shown in the diagram (FIG. 123), while the surface water throughout the whole length will be observed moving in the direction of the wind—say in the direction of the two arrows near to the surface of the water above and below it. But to re-establish the disturbed hydrostatic equilibrium, the water so heaped up will tend to flow back to the end from which it has been displaced, and as the wind prevents this taking place by a surface current, there will be set up a return current along the bottom of the canal, in a direction opposite to that of the wind, as indicated by the lowermost arrow in the diagram (FIG. 123). The return current in the ocean, however, is not always an under-current, but may sometimes be a lateral current. Thus a gale of wind blowing over ten degrees of latitude will cause a drag of water at the surface, but the return may be not an under current but a current on one side or the other of the area affected by the wind. Suppose, for instance, in the Mediterranean there is a strong east wind blowing along the African coast, the result will be a current from east to west along that coast, and return current along the northern coasts of the Mediterranean. The rise and fall of the water due to these motions are almost inextricably mixed-up with the true tidal rise and fall. There is another rise and fall, also connected with the heating effect of the sun, that I do not call a true tide, and that is a rise and fall due to change of atmospheric pressure. When the barometer is high over a large area of ocean, then, there and in neighboring places, the tendency to hydrostatic equilibrium causes the surface of the water to be lower, where it is pushed down by the greater weight of air, and to be higher where there is less weight over it. It does not follow that in every case it is lower, because there may not be time to produce the effect, but there is this tendency. It is very well known that two or three days of low barometer make higher tides on our coast. In Scotland and England and Ireland, two or three days of low barometer generally produce all round the shore higher water than when the barometer is high; and this effect is chiefly noticed at the time of tidal high water, because people take less notice of low water—as at Portland where they think nothing of the double low water. Hence we hear continually of very high tides—very high water noticed at the time of high tides—when the barometer is low. We have not always, however, in this effect of barometric pressure really great tidal rise and fall. On the contrary we have the curious phenomenon that sometimes when the barometer is very low, and there are gales in the neighbourhood, there is very little rise and fall, as the water is kept heaped up and does not sink by anything like its usual amount from the extra high level that it has at high water. But I fear I have got into questions which are leading me away from my subject, and as I cannot get through them I must just turn back. Now think of the definition which I gave of the "tides," and think of the sun alone. The action of the sun cannot be defined as the cause of the solar tides. Solar tides are due to action of the sun, but all risings and fallings of the water due to the action of the sun are not tides. We want the quantification of the predicate here very badly. We have a true tide depending on the sun, the mean solar diurnal tide, having for its period twenty-four solar hours, which is inextricably mixed up with those meteorological tides that I have just been speaking of—tides depending on the sun's heat, and on the variation of the direction of the wind, and on the variation of barometric pressure according to the time of day. The consequence is that in tidal analysis, when we come to the solar tides, we cannot know how much of the analysed result is due to attraction, and how much to heating effect directly or indirectly, whether on water, or on air, or on water as affected by air. As to the lunar tides we are quite sure of them;—they are gravitational, and nothing but gravitational; but I hope to speak later of the supposed relation of the moon to the weather, and the relation that has to the tides. I have defined the tides as motions of water on the earth due to the attractions of the sun and of the moon. How are we to find out whether an observed motion of the water is a tide or is not a tide as thus defined? Only by the combination of theory and observation: if these afford sufficient reason for believing that the motion is due to attraction of the sun or of the moon, or of both, then we must call it a tide. It is curious to look back on the knowledge of the tides possessed in ancient times, and to find as early as two hundred years before the Christian era a very clear account given of the tides at Cadiz. But the Romans generally, knowing only the Mediterranean, had not much clear knowledge of the tides. At a much later time than that, we hear from the ancient Greek writers and explorers—Posidonius, Strabo, and others—that in certain remote parts of the world, in Thule, in Britain, in Gaul, and on the distant coasts of Spain, there were motions of the sea—a rising and falling of the water which depended in some way on the moon. Julius Cæsar came to know something about it; but it is certain the Roman Admiralty did not supply Julius Cæsar's captains with tide tables when he sailed from the Mediterranean with his expeditionary force, destined to put down anarchy in Britain. He says, referring to the fourth day after his first landing in Britain—"That night it happened to be full moon, which time is accustomed to give the greatest risings of water in the ocean, though our people did not know it." It has been supposed however that some of his people did know it—some of his quartermasters had been in England before and did know—but that the discipline in the Roman navy was so good that they had no right to obtrude their knowledge; and so, although a storm was raging at the time, he was not told that the water would rise in the night higher than usual, and nothing was done to make his transports secure higher up on the shore while he was fighting the Britons. After the accident Cæsar was no doubt told—"Oh, we knew that before, but it might have been ill taken if we had said so." Strabo says—"Soon after moonrise the sea begins to swell up and flow over the earth till the moon reaches mid heaven. As she descends thence the sea recedes till about moonset, when the water is lowest. It then rises again as the moon, below the horizon, sinks to mid heaven under the earth." It is interesting here to find the tides described simply with reference to the moon. But there is something more in this ancient account of Strabo; he says, quoting Posidonius—"This is the daily circuit of the sea. Moreover, there is a regular monthly course, according to which the greatest rise and fall takes place about new moon, then diminishing rise and fall till half moon, and again increasing till full moon." And lastly he refers to a hearsay report of the Gaditani (Cadizians) regarding an annual period in the amount of the daily rise and fall of the sea, which seems to be not altogether right, and is confessedly in part conjectural. He gave no theory, of course, and he avoided the complication of referring to the sun. But the mere mention of an annual period is interesting in the history of tidal theory, as suggesting that the rises and falls are due not to the moon alone but to the sun also. The account given by Posidonius is fairly descriptive of what occurs at the present day at Cadiz. Exactly the opposite would be true at many places; but at Cadiz the time of high water at new and full moon is nearly twelve o'clock. Still, I say we have only definition to keep us clear of ambiguities and errors; and yet, to say that those motions of the sea which we call tides depend on the moon, was considered, even by Galileo, to be a lamentable piece of mysticism which he read with regret in the writings of so renowned an author as Kepler. It is indeed impossible to avoid theorising. The first who gave a theory was Newton; and I shall now attempt to speak of it sufficiently to allow us to have it as a foundation for estimating the forces with which we are concerned, in dealing with some of the very perplexing questions which tidal phenomena present. We are to imagine the moon as attracting the earth, subject to the forces that the different bodies exert upon each other. We are not to take Hegel's theory—that the Earth and the Planets do not move like stones, but move along like blessed gods, each an independent being. If Hegel had any grain of philosophy in his ideas of the solar system, Newton is all wrong in his theory of the tides. Newton considered the attraction of the sun upon the earth and the moon, of the earth upon the moon, and the mutual attractions of different parts of the earth; and left it for Cavendish to complete the discovery of gravitation, by exhibiting the mutual attraction of two pieces of lead in his balance. Tidal theory is one strong link in the grand philosophic chain of the Newtonian theory of gravitation. In explaining the tide-generating force we are brought face to face with some of the subtleties, and with some of the mere elements, of physical astronomy. I will not enter into details, as it would be useless for those who already understand the tidal theory, and unintelligible to those who do not. I may just say that the moon attracts a piece of matter, for example a pound-weight, here on the earth, with a force which we compare with the earth's attraction thus. Her mass is 1/80 of the earth's, and she is sixty times as far away from the earth's centre as we are here. Newton's theory of gravitation shows, that when you get outside the mass of the earth the resultant attraction of the earth on the pound weight, is the same as if the whole mass of the earth were collected at the centre, and that it varies inversely as the square of the distance from the centre. The same law is inferred regarding the moon's attraction from the general theory. The moon's attraction on this pound weight is therefore 1/80/60×60, or 1/288,000 of the attraction of the earth on the same mass. But that is not the tidegenerating force. The moon attracts any mass at the nearest parts of the earth's surface with greater force than an equal mass near the centre; and attracts a mass belonging to the remoter parts with less force. Imagine a point where the moon is overhead, and imagine another point on the surface of the earth at the other end of a diameter passing through the first point and the centre of the earth (illustrated by B and A of FIG. 124, p. 284). The moon attracts the nearest point (B) with a force which is greater than that with which it attracts the farther point (A) in the ratio of the square of 59 to the square of 61. Hence the moon's attraction on equal masses at the nearest and farthest points differs by one fifteenth part of her attraction on an equal mass at the earth's centre, or about a 4,320,000th, or, roughly, a four-millionth, of the earth's attraction on an equal mass at its surface. Consequently the water tends to protrude towards the moon and from the moon. If the moon and earth were held together by a rigid bar the water would be drawn to the side nearest to the moon—drawn to a prodigious height of several hundred feet. But the earth and the moon are not so connected. We may imagine the earth as falling towards the moon, and the moon as falling towards the earth, but never coming nearer; the bodies, in reality, revolving round their common centre of gravity. A point nearest to the moon is as it were dragged away from the earth, and thus the result is that apparent gravity differs by about one four-millionth at the points nearest to and farthest from the moon. At the intermediate points of the circle C, D (FIG. 124, p. 284), there is a somewhat complicated action according to which gravitation is increased by about one 17-millionth, and its direction altered by about one 17-millionth, so that a pendulum 17,000 feet long, a plummet rather longer than from the top of Mont Blanc to sea level, would, if showing truly the lunar disturbing force, be deflected through a space of one thousandth of a foot. It seems quite hopeless by a plummet to exhibit the lunar disturbance of gravity. 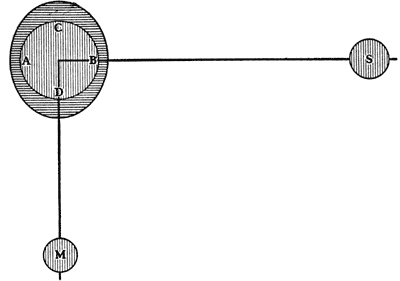 A spring balance to show the alteration of magnitude, and a plummet to show the change of direction are conceivable; but we can scarcely believe that either can ever be produced, with sufficient delicacy and consistency and accuracy to indicate these results. A most earnest and persevering effort has been made by Mr. George Darwin and Mr. Horace Darwin to detect variations in gravity due to lunar disturbance, and they have made apparatus which, notwithstanding the prodigious smallness of the effect to be observed, is in point of delicacy and consistency capable of showing it; but when they had got their delicate pendulum—their delicate plummet about the length of an ordinary second's pendulum—and their delicate multiplying gear to multiply the motion of its lower end by about a million times, and to show the result on a scale by the reflection of a ray of light, they found the little image incessantly moving backward and forward on the scale with no consistency or regularity; and they have come to the conclusion that there are continual local variations of apparent gravity taking place for which we know no rule, and which are considerably greater than the lunar disturbance for which they were seeking. That which they found—continual motions of the surface of the earth, and which was not the primary object of their investigation—is in some respects more interesting than what they sought and did not find. The delicate investigation thus opened up promises a rich harvest of knowledge. These disturbances are connected with earthquakes such as have been observed in a very scientific and accurate manner by Milne, Thomas Gray, and Ewing in Japan, and in Italy by many accurate observers. All such observations agree in showing continual tremor and palpitation of the earth in every part. One other phenomenon that I may just refer to now as coming out from tide—gauge observations, is a phenomenon called seiches by Forel, and described by him as having been observed in the lakes of Geneva and Constance. He attributes them to differences of barometric pressure at the ends of the lake, and it is probable that part of the phenomenon is due to such differences. I think it is certain, however, that the whole is not due to such differences. The Portland tide curve and those of many other places, notably the tide curve for Malta, taken about ten years ago by Sir Cooper Key, and observations on the Atlantic coasts and in many other parts of the world, show something of these phenomena; a ripple or roughness on the curve traced by the tide gauge, which, when carefully looked to, indicates a variation not regular but in some such period as twenty or twenty-five minutes. It has been suggested that they are caused by electric action! Whenever the cause of a thing is not known it is immediately put down as electrical! I would like to explain to you the equilibrium theory, and the kinetic theory, of the tides, but I am afraid I must merely say there are such things; and that Laplace in his great work, his Mécanique Céleste, first showed that the equilibrium theory was utterly insufficient to account for the phenomena, and gave the true principles of the dynamic action on which they depend. The resultant effect of the tide-generating force is to cause the water to tend to become protuberant towards the moon and the sun and from them, when they are in the same straight line, and to take a regular spheroidal form, in which the difference between the greatest and the least semi-diameter is about 2 feet for lunar action alone, and 1 foot for the action of the sun alone—that is a tide which amounts to 3 feet when the sun and moon act together (FIGS. 124 and 125), and to 1 foot only when they act at cross purposes (FIGS. 126 and 127), so as to produce opposite effects. These diagrams, FIGS. 124 to 127, illustrate spring and neap tides: the dark shading around the globe, E, representing a water envelope surrounding the earth. There has been much discussion on the origin of the word neap. It seems to be an Anglo-Saxon word meaning scanty. Spring seems to be the same as when we speak of plants springing up. I well remember at the meeting of the British Association at Edinburgh a French member who, meaning spring tides, spoke of the grandes marées du printemps. Now you laugh at this; and yet, though he did not mean it, he was quite right, for the spring tides in the spring time are greater on the whole than those at other times, and we have the greatest spring tides in the spring of the year. But there the analogy ceases, for we have also very high spring tides in autumn. Still the meaning of the two words is the same etymologically. Neap tides are scanty tides, and spring tides are tides which spring up to remarkably great heights. The equilibrium theory of the tides is a way of putting tidal phenomena. We say the tides would be so and so if the water took the figure of equilibrium. Now the water does not cover the whole earth, as we have assumed in the diagrams (FIGS. 124-127), but the surface of the water may be imagined as taking the same figure, so far as there is water, that it would take if there were water over the whole surface of the earth. But here a difficult question comes in—namely, the attraction of the water for parts of itself. If we consider the water flowing over the whole earth this attraction must be taken into account. If we imagine the water of exceedingly small density so that its attraction on itself is insensible compared with that of the earth, we have thus to think of the equilibrium theory. But, on the other hand, if the water had the same density as the earth, the result would be that the solid nucleus would be almost ready to float; and now imagine that the water is denser than the earth, and we put the tides out of consideration altogether. Think of the earth covered over with mercury instead of water—a layer of mercury a foot deep. The solid earth would tend to float, and would float, and the result would be that the denser liquid would run to, and cover one side up to a certain depth, and the earth would be as it were floating out of the sea. That explains one curious result that Laplace seems to have been much struck with: the stability of the ocean requires that the density of the water should be less than that of the solid earth. But take the sea as having the specific gravity of water, the mean density of the earth is only 5.6 times that of water, and this is not enough to prevent the attraction of water for water from being sensible. Owing therefore to the attraction of the water for parts of itself the tidal phenomena are somewhat larger than they would be without it, but neglecting this, and neglecting the deformation of the solid earth, we have the ordinary equilibrium theory. Why does the water not follow the equilibrium theory? Why have we tides of 20 feet or 30 feet or 40 feet in some places, and only of 2 or 3 feet in others? Because the water has not time in the course of 12 hours to take the equilibrium figure, and because after tending towards it, the water runs beyond it. I ask you to think of the oscillations of water in a trough. Look at this diagram (FIG. 128), which will help you to understand how the tidal effect is prodigiously magnified by a dynamical action due to the inertia of the water. The tendency of water in motion to keep its motion prevents it from taking the figure of equilibrium. [A chart showing the tides of the English Channel was exhibited, from which it was seen that while at Dover there were tides of 21 feet, there was at Portland very little rise and fall.] Imagine a canal instead of the English Channel, a canal stopped at the Straits of Dover and at the opposite end at Land's End, and imagine somehow a disturbing force causing the water to be heaped up at one end. There would be a swing of water from one end to the other, and if the period of the disturbing force approximately agreed with the period of free oscillation, the effect would be that the rise and fall would go vastly above and below the range due to equilibrium action. Hence it is we have the 21 feet rise and fall at Dover. The very little rise and fall at Portland is also illustrated in the uppermost figure of this diagram (FIG. 128). Thus high water at Dover is low water at Land's End, and the water seesaws as it were about a line going across from Portland to Havre (represented by N in the figure); not a line going directly across, however, for on the other side of the Channel there is a curious complication. At the time of high water at Dover there is hardly any current in the Channel. As soon as the water begins to fall at Dover the current begins to flow west through the whole of the Channel. When it is mid-tide at Dover the tide is flowing fastest in the Channel. This was first brought to light by Admiral Beechey. I wish I had time to show the similar theory as to the tides in the Irish Channel. The water runs up the English Channel to Dover, and up the Irish Channel to fill up the basin round the Isle of Man. Take the northern mouth of the Irish Channel between the Mull of Cantire and the northeast coast of Ireland. The water rushes in through the straits between Cantire and Rathlin Island, to fill up the Bay of Liverpool and the great area of water round the Isle of Man. This tidal wave entering from the north, running southward through the Channel, meets in the Liverpool basin with the tidal stream coming from the south entrance, and causes the time of high water at Liverpool to be within half-an-hour of the time of no currents in the northern and southern parts of the Channel. I would like to read you the late Astronomer-Royal's appreciation of Laplace's splendid work on the tides. Airy says of Laplace: "If now, putting from our thoughts the details of the investigation, we consider its general plan and objects, we must allow it to be one of the most splendid works of the greatest mathematician of the past age. To appreciate this, the reader must consider, first, the boldness of the writer, who, having a clear understanding of the gross imperfections in the methods of his predecessors, had also the courage deliberately to take up the problem on grounds fundamentally correct (however it might be limited by suppositions afterwards introduced); secondly, the general difficulty of treating the motion of fluids; thirdly, the peculiar difficulty of treating the motions when the fluids cover an area which is not plane but convex; and fourthly, the sagacity of perceiving that it was necessary to consider the earth as a revolving body, and the skill of correctly introducing this consideration. This last point alone, in our opinion, gives a greater claim for reputation than the boasted explanation of the long inequality of Jupiter and Saturn." Tidal theory must be carried on along with tidal observations. Instruments for measuring and recording the height of the water at any time give us results of observations. Here is such an instrument—a tide gauge. The floater is made of thin sheet copper, and is suspended by a fine platinum wire. The vertical motion of the floater, as the water rises and falls, is transmitted, in a reduced proportion by a single pinion and wheel, to this frame or marker, which carries a small marking pencil. The paper on which the pencil marks the recording curve, is stretched on this cylinder, which, by means of the clockwork, is caused to make one revolution every twenty-four hours. The leaning-tower-of-Pisa arrangement of the paper-cylinder, and the extreme simplicity of the connection between marker and floater, constitute the chief novelty. This tide gauge is similar to one now in actual use, recording the rise and fall of the water in the River Clyde, at the entrance to the Queen's Dock, Glasgow. A sheet bearing the curves (FIG. 130) traced by that machine during a week is exhibited. After the observations have been taken, the next thing is to make use of them. Hitherto this has been done by laborious arithmetical calculation. I hold in my hand the Reports of the late Tidal Committee of the British Association with the results of the harmonic analysis—about eight years' work carried on with great labour, and by aid of successive grants from the British Association. The Indian Government has continued the harmonic analysis for the seaports of India. The Tide Tables for Indian Ports for the Year 1882, issued under the authority of the Indian Government, show this analysis as in progress for the following ports, viz. : Aden, Kurrachee, Okha Point and Beyt Harbour at the entrance to the Gulf of Cutch, Bombay, Karwar, Beypore, Paumben Pass, Madras, Vizagapatam, Diamond Harbour, Fort Gloster and Kidderpore on the River Hooghly, Rangoon, Moulmein, and Port Blair. Mr. Roberts, who was first employed as calculator by the Committee of the British Association, has been asked to carry on the work for the Indian Government, and latterly, in India, native calculators under Major Baird, have worked by the methods and forms by which Mr. Roberts had worked in England for the British Association. The object is to find the values of the different tidal constituents. We want to separate out from the whole rise and fall of the ocean the part due to the sun, the part due to the moon, the part due to one portion of the moon's effect, and the part due to another. There are complications depending on the moon's position—declinational tides according as the moon is or is not in the plane of the earth's equator—and also on that of the sun. Thus we have the diurnal declinational tides. When the moon is in the north declination (FIG. 131) we have (in the equilibrium theory) higher water at lunar noon than at lunar midnight. That difference in the height of high water, and the corresponding solar noon tides and solar midnight tides, due to the sun not being in the earth's equator, constitute the lunar and solar diurnal declinational tides. In summer the noon high water might be expected to be higher than the midnight high water, because the sun is nearer overhead to us than to our Antipodes. By kind permission of Sir Frederick Evans, I am able to place before you these diagrams of curves drawn by Captain Harris, R. N., of the Hydrographic Department of the Admiralty, exhibiting the rise and fall of tides in Princess Royal Harbour, King George Sound, Western Australia, from January 1st to December 31st, 1877, and in Broad Sound, Queensland, Australia, from July 15th, 1877, to July 23rd, 1878. Look at this one of these diagrams, a diagram of the tides at the northeast corner of Australia. For several days high water always at noon. When the tides are noticeable at all we have high water at noon, and when the tides are not at noon they are so small that they are not taken notice of at all. It thus appears as if the tides were irrespective of the moon, but they are not really so. When we look more closely, it is a full moon if we have a great tide at noon; or else it is new moon. It is at half moon that we have the small tides, and when they are smallest we have high water at six. There is also a great difference between day and night high water; the difference between them is called the diurnal tide. A similar phenomenon is shown on a smaller scale in this curve, drawn by the first tidepredicting machine. At a certain time the two high waters become equalised, and the two low waters very unequal (see p. 290 for real examples). The object of the harmonic analysis is to analyse out from the complicated curve traced by the tide gauge the simplest harmonic elements. A simple harmonic motion may be imagined as that of a body which moves simply up and down in a straight line, keeping level with the end of a clock hand, moving uniformly round. The exceedingly complicated motion that we have in the tides is analysed into a series of simple harmonic motions in different periods and with different amplitudes or ranges; and these simple harmonic constituents added together give the complicated tides. All the work hitherto done has been accomplished by sheer calculation; but calculation of so methodical a kind that a machine ought to be found to do it. The Tidal Harmonic Analyser consists of an application of Professor James Thomson's disk-globe-and-cylinder integrator to the evaluation of the integrals required for the harmonic analysis. The principle of the machine and the essential details are fully described and explained in papers communicated by Professor James Thomson and the author to the Royal Society, in 1876 and 1878, and published in the Proceedings for those years;  also reprinted, with a postscript dated April, 1879, in Thomson and Tait's Natural Philosophy, Second Edition, Appendix B. It remains now to describe and explain the actual machine referred to in the last of these communications, which is the only tidal harmonic analyser hitherto made. 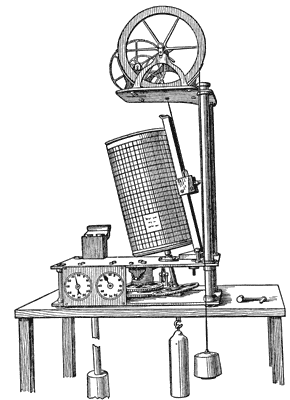 It may be mentioned, however, in passing, that a similar instrument, with the simpler construction wanted for the simpler harmomic analysis of ordinary meteorological phenomena, has been constructed for the Meteorological Committee, and is now regularly at work at their office, harmonically analysing the results of meteorological observations, under the superintendence of Mr. R. H. Scott. The general arrangement of the several parts may be seen from FIG. 132. The large circle at the back, near the center, is merely a counter to count to the days, months, and years for four years, being the leap year period. It is driven by a worm carried on an intermediate shaft, with a toothed wheel geared on another on the solar shaft. In front of the centre is the paper drum, which is on the solar shaft, and goes round in the period corresponding to twelve mean solar hours. 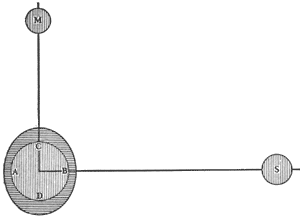 On the extreme left, the first pair of disks, with globes and cylinders, and crank shafts with cranks at right angles between them, driving their two cross-heads, corresponds to the K1, or luni-solar diurnal tide. The next pair of disk-globe-and-cylinders corresponds to M, or the mean lunar semi-diurnal tide, the chief of all the tides. The next pair lie on the two sides of the main shaft carrying the paper drum, and correspond to S, the mean solar semi-diurnal tide. The first pair on the right correspond to O, or the lunar diurnal tide. The second pair on the right correspond to P, the solar diurnal tide. The last disk on the extreme right is simply Professor James Thomson's disk-globe-and-cylinder integrator, applied to measure the area of the curve as it passes through the machine. The idle shafts for the M and the O tides are seen in front respectively on the left and right of the centre. The two other longer idle shafts for the K and the P tides are behind, and therefore not seen. That for the P tide serves also for the simple integrator on the extreme right. The large hollow square brass bar, stretching from end to end along the top of the instrument, and carrying the eleven forks rigidly attached to it, projecting downwards, is moved to and fro through the requisite range by a rack and pinion, worked by a handle and crank in front above the paper cylinder, a little to the right of its centre. Each of these eleven forks moves one of the eleven globes of the eleven disk-globe-and-cylinder integrators of which the machine is composed. The other handle and crank in front, lower down and a little to the left of the centre, drives by a worm, at a conveniently slow speed, the solar shaft, and through it, and the four idle shafts, the four other tidal shafts. To work the machine the operator turns with his left hand the driving crank, and with his right hand the tracing crank, by which the fork-bar is moved. His left hand he turns always in one direction, and at as nearly constant a speed as is convenient to allow his right hand, alternately in contrary directions, to trace exactly with the steel pointer the tidal curve on the paper, which is carried across the line of to-and-fro motion of the pointer by the revolution of the paper drum, of which the speed is in simple proportion to the speed of the operator's left hand. The eleven little counters of the cylinders in front of the disks are to be set each at zero at the commencement of an operation, and to be read off from time to time during the operation, so as to give the value of the eleven integrals for as many particular values of the time as it is desired to have them. A+B sin θ+C cos θ+D sin 2θ+E cos 2θ. for the deviation of the compass in an iron ship. The first instrument which I designed and constructed for use as a Tide Predictor was described in the Catalogue of the Loan Collection of Scientific Apparatus at South Kensington in 1876; and the instrument itself was presented by the British Association to the South Kensington Museum, where it now is. The second instrument constructed on the same principle is in London, and is being worked under the direction of Mr. Roberts, analysing the tides for the Indian ports. The result of this work is these books (Tide Tables for Indian Ports) in which we have, for the first time, tables of the times and heights of high water and low water for fourteen of the Indian ports. To predict the tides for the India and China Seas and Australia we have a much more difficult thing to do than for the British ports. The Admiralty Tide Tables give all that is necessary for the British ports, practically speaking; but for other parts of the world generally the diurnal tide comes so much into play that we have exceedingly complicated action. The most complete thing would be a table showing the height of the water every hour of the twenty four. No one has yet ventured to do that generally for all parts of the world; but for the comparatively complicated tides of the India Seas, the curves traced by the Tide Predictor from which is obtained the information given in these Indian tide table, do actually tell the height of the water for every instant of the twenty-four hours. A long cord of which one end is held fixed passes over one pulley, under another, and so on. 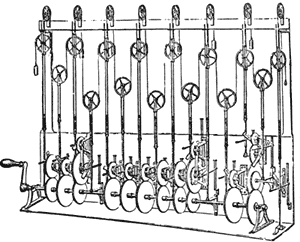 These eleven pulleys are all moved up and down by cranks, and each pulley takes in or lets out cord according to the direction in which it moves. These cranks are all moved by trains of wheels gearing into the eleven wheels fixed on this driving shaft. The greatest number of teeth on any wheel is 802 engaging with another of 423. All the other wheels have comparatively small numbers of teeth. The machine is finished now, except a cast-iron sole and cast-iron back. A flywheel of great inertia enables me to turn the machine fast, without jerking the pulleys, and so to run off a year's curve in about twenty-five minutes. This machine is arranged for fifteen constituents in all and besides that there is an arrangement for analysing out the long period tides. The following table shows how close an approximation to astronomical accuracy is given by the numbers chosen for the teeth of the several wheels. These numbers I have found by the ordinary arithmetical progress of converging fractions. Speed in Degrees per Mean Solar Hour. Losses of Angle in Machine. To-day (Aug. 25, 1882), a committee, consisting of only two members, Mr. George Darwin and Professor Adams of Cambridge, have been appointed, and one of their chief objects will be to examine the long period tides. There is one very interesting point I said I would endeavour to speak of if I had time; I have not time, but still I must speak of it—the influence of the moon on the weather. "We almost laugh when we hear of the influence of the moon on the weather," Sir F. Evans said to me, "but there is an influence." Gales of wind are remarkably prevalent in Torres Straits and the neighbourhood about the time of new and full moon. This was noticed by Dr. Rattray, a surgeon in the navy, in connection with observations made by the surveying ship, Fly, during the three years 1841-44. Dr. Rattray noticed that at those times there was a large area of coral reef uncovered at the very low water of the spring tides, extending out some sixty or seventy miles from land. This large area becomes highly heated, and the great heating of that large portion of land gives rise to a tendency to gales at the full and change, that is at the new and full moon. This indirect effect of the moon upon the weather through the tides is exceedingly interesting; but it does not at all invalidate the scientific conclusion that there is no direct influence, and the general effect of the moon on the weather—the changes in the moon and the changes in the weather, and their supposed connection—remains a mere chimæra. The subject of elastic tides in which they yielding of the solid earth is taken into account is to be one of the primary objects of Mr. G. Darwin's committee. The tide-generating force which tends to pull the water to and from the moon, tends to pull the earth also. Imagine the earth made of indiarubber and pulled out to and from the moon. It will be made prolate (FIG. 134). If the earth were of india-rubber the tides would be nothing, the rise and fall of the water relatively to the solid would be practically nil. If the earth (as has long been a favourite hypothesis of geologists) had a thin shell 20 or 30 miles thick with liquid inside, there would be no such thing as tides of water rising and falling relatively to land, or sea-bottom. The earth's crust would yield to and from the moon, and the water would not move at all relatively to the crust. If the earth were even as rigid as glass all through, calculation shows that the solid would yield so much that the tides could only be about one third of what they would be if the earth were perfectly rigid. Again, if the earth were two or three times as rigid as glass, about as rigid as a solid globe of steel, it would still, considering its great dimensions, yield two or three feet to that great force, which elastic yielding would be enough to make the tides only two thirds of what they would be if the earth were perfectly rigid. Mr. G. Darwin has made the investigation by means of the lunar fortnightly tides, and the general conclusion, subject to verification, is that the earth does seem to yield somewhat, and may have something like the rigidity of a solid globe of steel. (1) Gravitation.—The great theory of gravitation put before us by Newton asserts that every portion of matter in the universe attracts every other portion; and that the force depends on the masses of the two portions considered, and on the distance between them. Now, the first great point of Newton's theory is, that bodies which have equal masses are equally attracted by any other body, a body of double mass experiencing double force. This may seem only what is to be expected. It would take more time than we have to spare were I to point out all that is included in this statement; but let me first explain to you how the motions of different kinds of matter depend on a property called inertia. I might show you a mass of iron as here. Consider that if I apply force to it, it gets into a state of motion; greater force applied to it, during the same time, gives it increased velocity, and so on. Now, instead of a mass of iron, I might hang up a mass of lead, or a mass of wood, to test the equality of the mass by the equality of the motion which is produced in the same time by the action of the same force, or in equal times by the action of equal forces. Thus, quite irrespectively of the kind of matter concerned, we have a test of the quantity of matter. You might weigh a pound of tea against a pound of brass without ever putting them into the balance at all. You might hang up one body by a proper suspension, and you might, by a spring, measure the force applied, first to the one body, and then to the other. If the one body is found to acquire equal velocity under the influence of equal force for equal times as compared with the other body, then the mass of the one is said to be equal to the mass of the other. I have spoken of mutual forces between any two masses. Let us consider the weight or heaviness of a body on the earth's surface. Newton explained that the attraction of the whole earth upon a body—for example, this 56 pounds mass of iron—causes its heaviness or weight. Well, now, take 56 pounds of iron here, and take a mass of lead, which, when put in the balance, is found to be of equal weight. You see we have quite a new idea here. You weigh this mass of iron against a mass of lead, or to weigh out a commodity for sale; as, for instance, to weigh out pounds of tea, to weigh them with brass weights is to compare their gravitations towards the earth—to compare the heaviness of the different bodies. But the first subject that I asked you to think of had nothing to do with heaviness. The first subject was the mass of the different bodies as tested by their resistance to force tending to set them in motion. I may just say that the property of resistance against being set into motion, and again against resistance to being stopped when in motion, is the property of matter called inertia. The first great point in Newton's discovery shows, then, that if the property of inertia is possessed to an equal degree by two different substances, they have equal heaviness. One of his proofs was founded on the celebrated guinea and feather experiment, showing that the guinea and feather fall at the same rate when the resistance of the air is removed. Another was founded upon making pendulums of different substances—lead, iron, and wood to vibrate, and observing their times of vibration. Newton thus discovered that bodies which have equal heaviness have equal inertia. The other point of the law of gravitation is, that the force between any two bodies diminishes as the distance increases, according to the law of the inverse square of the distance. That law expresses that, with double distance, the force is reduced one quarter, at treble distance the force is reduced to one-ninth part. Suppose we compare forces at the distance of one million miles, then again at the distance of two and a half million miles, we have to square the one number, then square the other, and find the proportion of the square of the one number to the square of the other. The forces are inversely as the squares of the distance, that is the most commonly quoted part of the law of gravitation; but the law is incomplete without the first part, which establishes the relation between two apparently different properties of matter. Newton founded this law upon a great variety of different natural phenomena. The motion of the planets round the sun, and the moon round the earth, proved that for each planet the force varies inversely as the square of its distance from the sun; and that from planet to planet the forces on equal portions of their masses are inversely as the squares of their distances. The last link in the great chain of this theory is the tides. (2) Tide-Generating Force.—And now we are nearly ready to complete the theory of tide-generating force. The first rough view of the case, which is not always incorrect, is that the moon attracts the waters of the earth towards herself and heaps them up, therefore, on one side of the earth. It is not so. It would be so if the earth and moon were at rest and prevented from falling together by a rigid bar or column. If the earth and moon were stuck on the two ends of a strong bar, and put at rest in space, then the attraction of the moon would draw the waters of the earth to the side of the earth next to the moon. But in reality things are very different from that supposition. There is no rigid bar connecting the moon and the earth. Why then does not the moon fall towards the earth? According to Newton's theory, the moon is always falling towards the earth. Newton compared the fall of the moon, in his celebrated statement, with the fall of a stone at the earth's surface, as he recounted, after the fall of an apple from the tree, which he perceived when sitting in his garden musing on his great theory. The moon is falling towards the earth, and falls in an hour as far as a stone falls in a second. It chances that the number 60 is nearly enough, as I have said before, a numerical expression for the distance of the moon from the earth in terms of the earth's radius. It is only by that chance that the comparison between the second and hour can be here introduced. Since there are 60 times 60 seconds in an hour, and about 60 radii of the earth in the distance from the moon, we are led to the comparison now indicated, but I am inverting the direction of Newton's comparison. He found by observation that the moon falls as far in an hour as a stone falls in a second, and hence inferred that the force on the moon is a 60th of the 60th of the force per equal mass on the earth's surface. Then he learned from accurate observations, and from the earth's dimensions, what I have mentioned as the moon's distance, and perceived the law of variation between the weight of a body at the earth's surface and the force that keeps the moon in her orbit. The moon in Newton's theory was always falling towards the earth. Why does it not come down? Can it be always falling and never come down? That seems impossible. It is always falling, but it has also a motion perpendicular to the direction in which it is falling, and the result of that continual falling is simply a change of direction of this motion. It would occupy too much of our time to go into this theory. It is simply the dynamical theory of centrifugal force. There is a continual falling away from the line of motion, as illustrated in a stone thrown from the hand describing an ordinary curve. You know that if a stone is thrown horizontally it describes a parabola—the stone falling away from the line in which it was thrown. The moon is continually falling away from the line in which it moves at any instant, falling away towards the point of the earth's centre, and falling away towards that point in the varying direction from itself. You can see it may be always falling, now from the present direction, now from the altered direction, now from the farther altered direction in a further altered line; and so it may be always falling and never coming down. The parts of the moon nearest to the earth tend to fall most rapidly, the parts furthest from the earth, least rapidly; in its own circle, each is falling away and the result is as if we had the moon falling directly. But while the moon is always falling towards the earth, the earth is always falling towards the moon; and each preserves a constant distance, or very nearly a constant distance from the common centre of gravity of the two. The parts of the earth nearest to the moon are drawn towards the moon with more force than an equal mass at the average distance; the most distant parts are drawn towards the moon with less force than corresponds to the average distance. The solid mass of the earth, as a whole, experiences, according to its mass, a force depending on the average distance; while each portion of the water on the surface of the earth experiences an attractive force due to its own distance from the moon. The result clearly is, then, a tendency to protuberance towards the moon and from the moon; and thus, in a necessarily most imperfect manner, I have explained to you how it is that the waters are not heaped up on the side next the moon, but are drawn up towards the moon and left away from the moon so as to tend to form an oval figure. The diagram (FIG. 125, p. 284) shows the protuberance of water towards and from the moon. It shows also the sun on the far side, I need scarcely say, with an enormous distortion of proportions, because without that it would be impossible in a diagram to show the three bodies. This illustrates the tendency of the tide-generating forces. (3) Elastic Tides.—But another question arises. This great force of gravity operating in different directions, pulling at one place, pressing in at another, will it not squeeze the earth out of shape? I perceive signs of incredulity; you think it impossible it can produce any sensible effect. Well, I will just tell you that instead of being impossible, instead of it not producing any such effect, we have to suppose the earth to be of exceedingly rigid material, in order that the effect of these distorting influences on it may not mask the phenomenon of the tides altogether. There is a very favourite geological hypothesis which I have no doubt many here present have heard, which perhaps till this moment many here present have believed, but which I hope no one will go out of this room believing, and that is that the earth is a mere crust, a solid shell thirty, or forty, or fifty miles thick at the most, and that it is filled with molten liquid lava. This is not a supposition to be dismissed as absurd, as ludicrous, as absolutely unfounded and unreasonable. It is a theory based on hypothesis which requires most careful weighing. But it has been carefully weighed and found wanting in conformity to the truth. On a great many different essential points it has been found at variance with the truth. One of these points is, that unless the material of this supposed shell were preternaturally rigid, were scores of times more rigid than steel, the shell would yield so freely to the tide-generating forces that it would take the figure of equilibrium, and there would be no rise and fall of the water, relatively to the solid land, left to show us the phenomena of the tides. Imagine that this (FIG. 134, p. 299) represents a solid shell with water outside, you can understand if the solid shell yields with sufficiently great freedom, there will be exceedingly little tidal yielding left for the water to show. It may seem strange when I say that hard steel would yield so freely. But consider the great hardness of steel and the smaller hardness of indiarubber. Consider the greatness of the earth, and think of a little hollow india-rubber ball, how freely it yields to the pressure of the hand, or even to its own weight when laid on a table. Now, take a great body like the earth: the greater the mass the more it is disposed to yield to the attraction of distorting forces when these forces increase with the whole mass. I cannot just now fully demonstrate to you this conclusion; but I say that a careful calculation of the forces shows that in virtue of the greatness of the mass it would require an enormously increased rigidity in order to keep in shape. So that if we take the actual dimensions of the earth at forty-two million feet diameter, and the crust at fifty miles thick, or two hundred and fifty thousand feet, and with these proportions make the calculation, we find that something scores of times more rigid than steel would be required to keep the shape so well as to leave any appreciable degree of difference from the shape of hydrostatic equilibrium, and allow the water to indicate, by relative displacement, its tendency to take the figure of equilibrium; that is to say, to give us the phenomena of tides. The geological inference from this conclusion is, that not only must we deny the fluidity of the earth and the assertion that it is encased by a thin shell, but we must say that the earth has, on the whole, a rigidity greater than that of a solid globe of glass of the same dimensions; and perhaps greater than that of a globe of steel of the same dimensions. But that it cannot be less rigid than a globe of glass, we are assured. It is not to be denied that there may be a very large space occupied by liquid. We know there are large spaces occupied by lava; but we do not know how large they may be, although we can certainly say that there are no such spaces, as can in volume be compared with the supposed hollow shell, occupied by liquid constituting the interior of the earth. The earth as a whole must be rigid, and perhaps exceedingly rigid, probably rendered more rigid than it is at the surface strata by the greater pressure in the greater depths. The phenomena of underground temperature, which led geologists to that supposition, are explained otherwise than by their assumption of a thin shell full of liquid; and further, every view we can take of underground temperature, in the past history of the earth, confirms the statement that we have no right to assume interior fluidity. The various instruments and tide-curves referred to in this lecture are fully described and illustrated in a paper on "The Tide Gauge, Tidal Harmonic Analyser, and Tide Predicter," read before the Institution of Civil Engineers, on 1st March, 1881, and published in their Proceedings for that date. Vide vol. xxiv. p. 262, and vol. xxvii. p. 371. Proc. Royal Society, June 17, 1869; (vol. xviii. p. 72).